Crystal Mind provides natural Hi-Omega EPA to DHA with added magnesium and Zinc. Natural Hi-EPA Omega-3 with Omega-6-GLA, Folic Acid, Vitamin B6, Vitamin B12, Magnesium And Zinc. Dietary supplement recommended for people over 3 years of age. 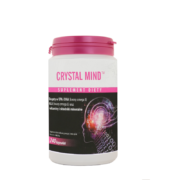 Dietary supplement Crystal Mind™ rich in EPA and DHA (omega-3), GLA (omega-6) and vitamins and mineral ingredients. 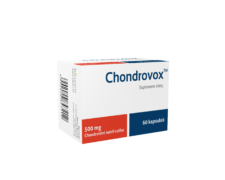 Dietary supplement recommended for people over 3 years of age. Store in a dry place, at room temperature, keep out of children’s reach. Recommended dose: 4 capsules daily (2x2 capsules) during the first 12 weeks (if you begin supplementation or you had a longer break) to form proper levels of essential fatty acids in the organism. After this period, you can reduce the dose to 1 capsule daily. Warning: Do not exceed the recommended daily dose. The dietary supplement cannot be used as the substitute for the varied diet and healthy lifestyle. Naturally rich in acids EPA and DHA fish oil concentrate, magnesium oxide (magnesium), borage oil, zinc oxide (zinc), cyanocobalamin (vitamin B12), pyridoxine hydrochloride (vitamin B6), folic acid, auxiliary ingredients: palm oil, beeswax, hydrogenated coconut oil, soy lecithin, coating ingredients: beef gelatine, glycerol, purified water, black iron oxide, red iron oxide. Biolevox™ Complex bis supplements diet with ingredients that naturally occur in the joint structures and support normal functioning of joints. 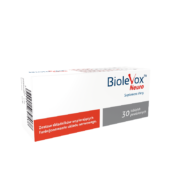 Biolevox Neuro is a set of components to support the functioning of the nervous system. 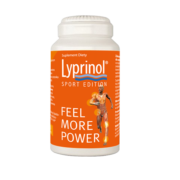 Lyprinol Sport Edition is a supplement for athletes. 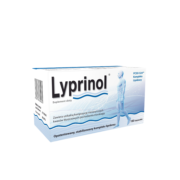 The preparation contains original lipid composition PCSO-524, obtained by highly advanced biotechnology.